Step 1: Heat 2 tablespoons of the oil from the sun-dried tomatoes in a heavy large skillet over medium heat. Add the onion and saute until tender, about 3 minutes. Stir in the garlic and saute until fragrant, about 1 minute. Add the tomato paste and cook for 2 minutes, stirring constantly. Add the wine and sun-dried tomatoes and simmer until the liquid reduces by half, about 2 minutes. Step 2: Meanwhile, bring a large pot of salted water to a boil. Add the pasta and cook until al dente, stirring occasionally, about 5 minutes. Drain, reserving 1/2 cup of cooking liquid. Add the pasta to the tomato mixture and toss to coat, adding some reserved cooking liquid to moisten. Season the pasta, to taste, with salt and pepper. Sprinkle with the goat cheese and parsley and stir. Mound the pasta into bowls and serve. 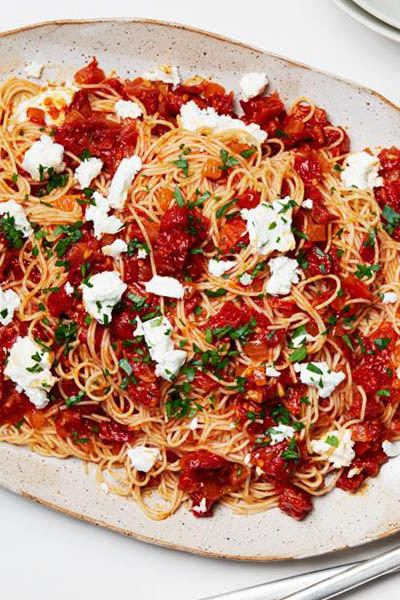 Enjoy this fresh angel hair pasta recipe from FoodNetwork!